Nutanix and Citrix take the guesswork out of app and desktop virtualization. The secure and scalable solution delivers a brilliant user experience while reducing infrastructure complexity, providing a VDI solution that is affordable to all. Nutanix InstantOn for Citrix Cloud enables fast, easy delivery of secure digital workspaces for today’s hybrid cloud world. By combining Nutanix scale-as-you-grow architecture with the cloud simplicity of Citrix Virtual Apps and Desktops Service, you can reduce ongoing management costs, alleviate infrastructure complexity, and deliver high-performance access to applications and desktops to every user. Nutanix InstantOn for Citrix Cloud is a Citrix Ready verified, turnkey digital workspace solution that makes it easy to get started today. Ready for Citrix Virtual Apps and Desktops to provide additional flexibility and attractive cost alternatives for customers. Nutanix strives to free IT staff from just ‘keeping the lights on’, with one-click operations through Nutanix Prism for orchestration, upgrades, and management. 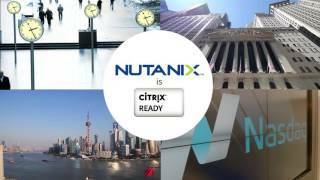 A joint Nutanix and Citrix solution leveraging Acropolis and a complete Citrix user workspace is designed to help datacenter and desktop teams bring IT's focus back to the end-user with favorable economics, streamlined management, scalability, and maintain the focal point on user experience. This complete Nutanix Acropolis solution provides customers with a high-performance, scalable infrastructure to power its industry-leading Citrix Virtual Apps and Desktops® and Citrix Virtual Apps® products.